It's a quick-fire return for vintage German Metallers Rage, 'Seasons Of The Black' following hot on the heels of last year's 'The Devil Strikes Again'. That 2016 effort was also something of a return to form, the band seemingly stagnating before the only ever present in their thirty-three years together, singer and bassist Peavy Wagner, completely refreshed the line-up as guitarist Marcos Rodriguez and drummer Vassilios "Lucky" Maniatopoulos breathed new life into the band. Thankfully the trio have stayed strong, coming together once more to offer up this outfit's twenty-fourth album (if you include the Avenger debut – 'Seasons Of The Black' coming with a six track bonus disc of re-recorded Avenger material!) and deliver a release that stays true to the roots of Rage. If you're looking for reinvention or departures, then you should turn elsewhere, the heads down Teutonic Metal that has always been Rage's specialty still the driving force behind almost everything they do. I say "almost everything" because there is a strangely beautiful Classical acoustic interlude in the shape of 'Gaia', where Wagner's gritty voice really shouldn't stand a chance but almost pulls it off, and 'Farewell', a string-laden, ambitious slower number which proves surprisingly beguiling in a snarly Scorpions kind of way. These, however, are the exceptions proving rules as you take your pick from 'Serpents In Disguise', 'Time Will Tell' or 'Septic Bite' to unearth a prime selection of top notch riffage and throat shredding vocals – there's almost an urge to break out the Strepsils as every gargling snarl makes you swallow and cough in sympathy. All of this is backed by a solid thunder of drums and a clutch of punishing guitar solos. Together, it makes for a slew of songs that might even explode with more force than last year's unexpectedly convincing hammer blows, this newly formed trio coming up trumps once again. 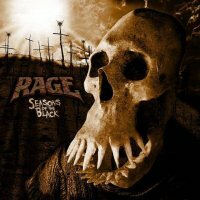 If there's a complaint, then it's that you can pretty much predict what you're going to find on 'Seasons Of The Black'. No real twists, turns or shocks expected or provided. However, if it's convincing slabs of no nonsense, heads down Metal you seek, then what's served up here will quickly work you into a ferocious, vintage, Rage.